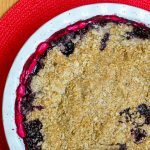 Bumbleberry Crumble - a terrific summertime recipe or even a freezer cleaner at any time of year. Use any combination of berries or chopped summer fruits you like. Mix together the sugar, corn starch and salt. Pour this mixture over the mixed berries/fruit. Stir well and pour into a deep dish pie plate or 9×9 square baking pan. For the crumble mix together the rolled oats, flour, baking powder, brown sugar, nutmeg and cinnamon. Using your hands rub in the butter until crumbly. Sprinkle the crumble over the fruit and press down slightly. Bake at 350 degrees for 40 to 50 minutes or until the crumble is evenly golden brown and the fruit is bubbling well at the bottom of the dish. Serve warm with good ice cream.